The Institute of Animal Genetics was founded in 1919 as the Animal Breeding Research Department, with F.A.E. Crew (1886-1973) as its first director. 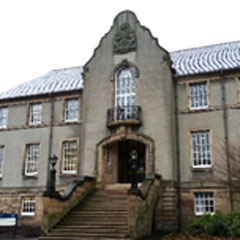 In 1930 it moved into this new building on the University of Edinburgh’s King’s Buildings site, designed by the architectural firm Lorimer and Matthew. The Institute developed an international reputation as a centre for genetics expertise, and in 1939 hosted the Seventh International Genetical Congress, a prestigious event which was interrupted by the outbreak of the Second World War. From 1947 the building also housed the ARC Unit of Animal Genetics under C.H. Waddington. The renamed Crew building is now home to the School of GeoSciences. 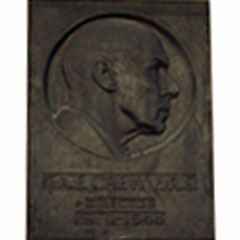 Relief portrait of Francis Albert Eley Crew, on wall in entrance area of the Crew Building.